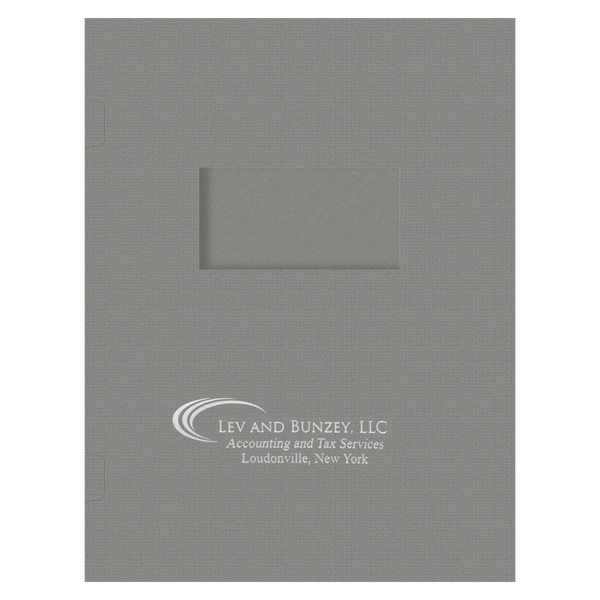 Lev and Bunzey, LLC chose Sterling Gray Linen stock for a corporate, professional look. The Metallic Platinum foil stamp provides just enough sheen to make the company's name and logo stand out from the darker stock. The half-circle design next to the name draws the eye to the text and creates motion, while the serif font indicates the firm is respectable and reliable. 1 PMS color printed on Side 1 of uncoated 80lb Wheat Tweed stock (currently unavailable). 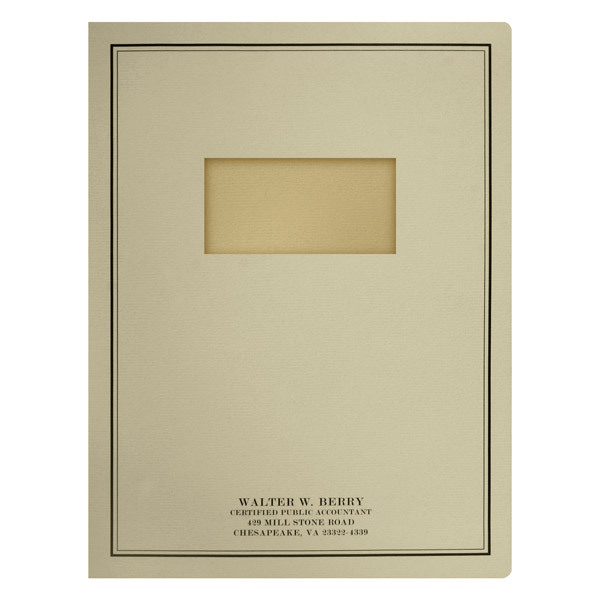 Pale tan Wheat Tweed stock creates an earthy, organic look for Walter Berry, CPA. Its understated hues and classic black text set a subdued, professional tone that tells clients their finances are in good hands. A black border adds a decorative element and complements the rectangular window, which lets recipients preview their tax returns and other important financial documents. Side 1 printed with 1 foil stamped area printed on uncoated 80lb Royal Blue Tweed stock. Spine attachment in matching stock. 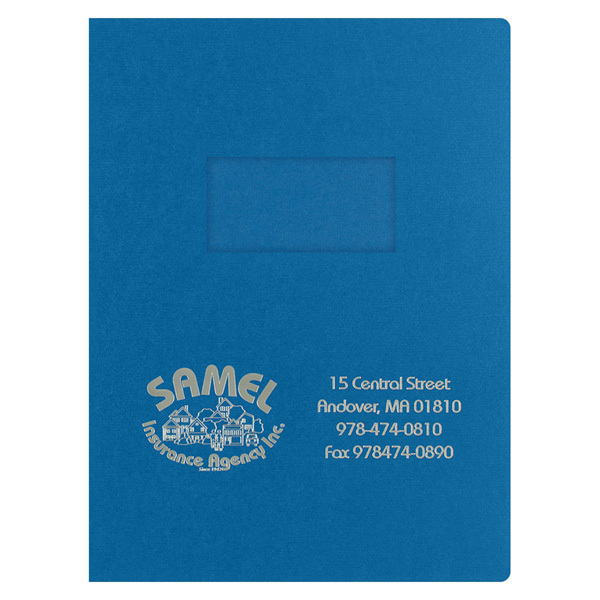 Samel Insurance Agency Inc. can protect all aspects of customers' lives with insurance coverage, as indicated by the company logo of a town full of businesses, homes, people and cars. The company's name, logo and contact information appear on the cover of this report cover in a Metallic Platinum foil stamp, which adds a smooth texture to the Royal Blue Tweed stock. Inside, documents will be safe in the spine attachment, which matches the stock. A die-cut window measuring 4" x 2" lets clients preview the title page to their 8 1/2" x 11" tax returns and other reports. The window's sharp, square corners complement the panels' round corners to create a smooth, modern style. Free of pockets, this item is perfectly suited to include a spine attachment to secure document packets. Both interior panels are open to an array of design options, including brand colors or logos, custom text, or even colorful images.